I haven't had much time to work on the railroad this summer, but here's an update on the small amount of progress that has been made since June. The final shape of things is starting to come together with a bit more scenery roughed in and a new upper level mining spur added. This new line tunnels right through the heart of Baxter's Butte to feed an ore tipple above the main tracks. Once completed, this track will feature the same back and forth automation as the lower line in town, using the same Circuitron electronics described in the last post. And last but not least, The TMMC has acquired some new rolling stock in the form of Bachmann's excellent side dump ore cars. These cars are die-cast metal and the side dump mechanism works very smoothly. They'll be repainted 'Thunder Mesa Gold' before all is said and done. That's about it for now, hope everyone is having a great summer and I look forward to getting more work done on the railroad once things slow down in the fall. 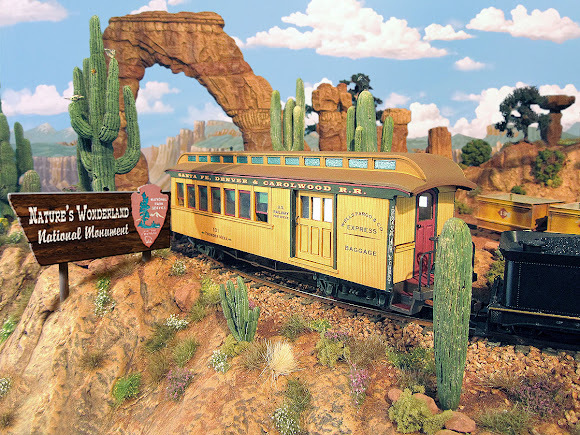 The upper level line has been converted to On18 and will soon connect to a Calico Gold Mining diorama on the expanded TMMC.